Wake Me up by Avicii was definitelyone of the biggest hits of 2013. The song reached number 1 in most of Europe, and did well in other parts of the world as well. The song is really interesting in that it combines soul, country guitar, electronic dance, and the result is just terrific. Some people refer to it as Don't Wake Me Up because of the lyrics, but the "Don't" is there officially. In our video lesson on Wake Me Up, we’ll be learning the chords and the strumming pattern they use during the intro and verses, as well as the riff, which acts as the bridge. The song would actually be pretty simple, the thing that makes it harder though is the speed. You’ll be learning “superhuman strumming” in this lesson, so don’t expect to play this one in a day. 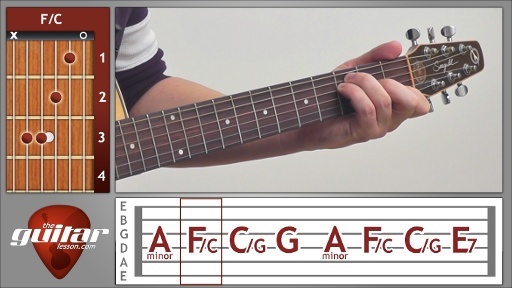 First of all, to play the song in the key of the original (key of D), you’ll need to use a capo at fret 2. That’s how I play the demonstration, but I’ll be teaching the song without the capo (key of C), since you don’t really need it to learn the song itself. Just know that if you want to play along with the original, you’ll need a capo. We’ll start off my learning to play the guitar chords to Wake Me Up, all 5 of them. Yeah, I told you, the song is pretty simple. Especially since you’ll be able to change in between the chords very easily, since you’ll be using shared finger chord changes for nearly all of the chords. Once we learn the chords and how to change in between them, we’ll start learning the strumming pattern to the song. This is where things will get a bit more interesting. Mike Einziger (guitarist of Incubus) uses a country style strumming pattern on the acoustic guitar, accenting the base note on the first beat. It gives a really interesting character to this otherwise electronic dance song. I’ll show you the exact strumming pattern (which you can also view in the tabs), but as I mention several times throughout the lesson, don’t play it fast at first. Make sure you can get everything sounding perfectly, and you can speed up afterwards incrementally. There is no use playing sloppy, remember that. During the verse, you’ll play almost the same chord progression, but you’ll be palm muting the chords while strumming them. This is a bit tricky as well, but it’s an important skill to learn in general. At the end of the lesson, we’ll learn the solo riff, it’s pretty cool (and fast) as well. If you’re using a capo to play in the original key of Wake Me Up, you’ll need to play the riff up 2 frets from where I teach you. All in all, this is an awesome song to learn, it’ll really improve your strumming skills as you speed it up. Wake Me Up was written by the Swedish DJ Avicci, soul singer Aloe Blacc, and Incubus’ guitarist Mike Einziger. The song was released in the summer of 2013. According to an interview Avicii gave, the song was written by chance, it was originally a fun experiment. Avicii and Mike Einziger wrote the melody and chord progression, and they called Aloe Blacc, who just happened to be in town, to write some lyrics. He did so in a few hours, and Wake Me Up was born. The single reached the top of the charts worldwide, and sold millions of copies, becoming Platinum certified in several countries. Wake Me Up was definitely one the most popular songs of 2013, some even call in the summer anthem. Sorry, but you've reached a premium content area. The download of the Wake Me Up tablature file is only available to premium members. Sorry, the same goes for the backing track. To download the backing track to Wake Me Up, please log in and revisit this page.